Featuring call and Bluetooth message alert notifications, the SmartFit Mini works with all iPhones, Samsung Android phones and many other devices. We have sold over 100,000 on OpenSky, with the latest upgraded model for 2018; the new chips support iOS and Android -- beware of generic or duplicate chips that cannot support iOS. The SmartFit Mini is a smaller, lighter version of the health monitor watch that monitors your activity, sleep and much more. It also has an alert function that will notify you by vibrating if you receive an incoming call or text message. Featuring an OLED screen, the watch face is bright and clear in any light. The band is made of silicone and includes a metal buckle-style lock to keep it in place. The secure buckle-style band is completely adjustable and won't fall off your wrist. 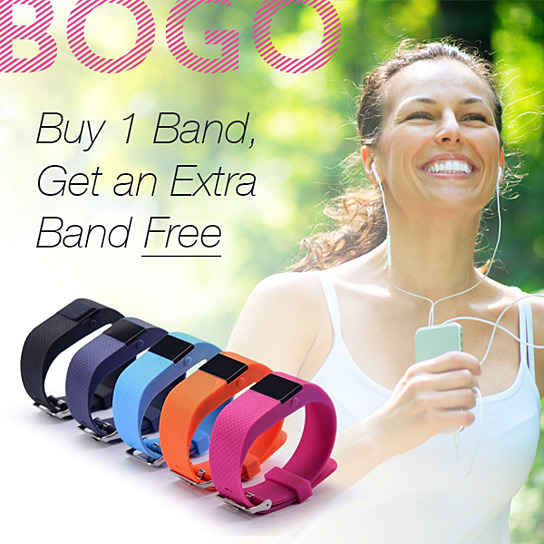 You will receive your choice of band color plus 1 FREE EXTRA BAND, subject to the colors available when you order. You can interchange them and itâ€™ll feel like a whole new watch! Call Alert / Notifier: the band vibrates when there is an incoming call (does not show caller ID). Works on both Android and Apple phones.